3 steps to establish your footprint! stand-alone exhibits. What is your footprint? Develop your brand... and leverage it! Any size, any app… for any audience! Delivery, Installation and Management of your Backdrop for your Location including Trade Shows, Conventions, Company Facilities, Exhibits and Banners/Signage. Wherever!  Your footprint for your audience! Check out our Free Print Design Offer! MediaScape Design is located in Louisville, KY offering everything you need for creative corporate branding. 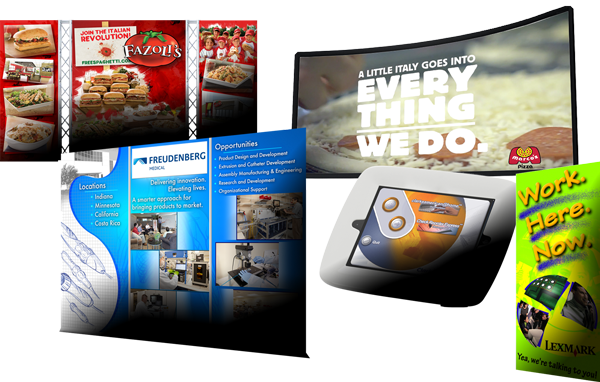 We specialize in custom trade show exhibits, large format printing to digital kiosk technologies and videos. Develop Your Brand, and Leverage It! Identity — Custom design of corporate brand including logo treatment and print layouts such as business cards, letterhead, envelopes, adhesives, signage and an array of marketing leave-behinds. Layouts — Custom background treatments with branding, photos and text for printed and digital use. 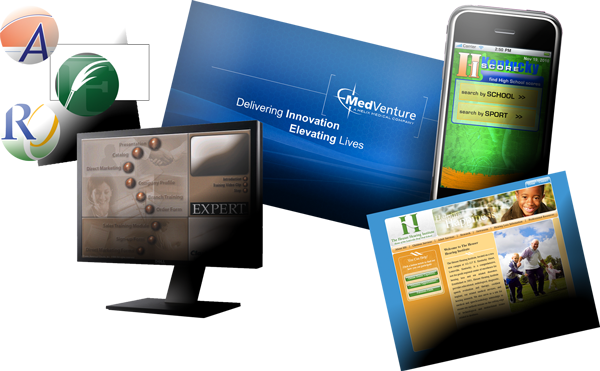 Templates — Use of custom background creative treatments for small to large-scale presentation purposes, including interactive, online and video implementation. Online — Design and development of an online presence from a corporate web site to internal applications including customer/vendor communications and event usage as a kiosk or presentation segment. Mobile — A continuation of the “online” development to include smart phone and tablet usage and compatibility. Large Format Printing — Produced for any size and usage, indoor/outdoor with an array of rigging parameters, materials and use of installed lighting. Audio and Video — Custom storyboard, scripting and production including motion graphics, sound design, on-camera/on-location and music. Audio/Video can be integrated including flat panel, larger format video playback hardware, projection and PA.
Interactive — Custom interactive application for stand-alone individual or mass-distributed usage, including the integration of audio/video, data collection and instant printing. Data Collection — Online and mobile-based applications designed to assisted customer interaction and help build a customer database, leveraging technology such as interactive stand-alone kiosks and mobile devices and email-based communication both prior and after your event. Leave Behind Materials — traditional forms of materials such as print pieces, DVDs and other branded leave-behinds… jump drives, mouse pads, etc. Wherever!! Your Footprint for Your Audience. 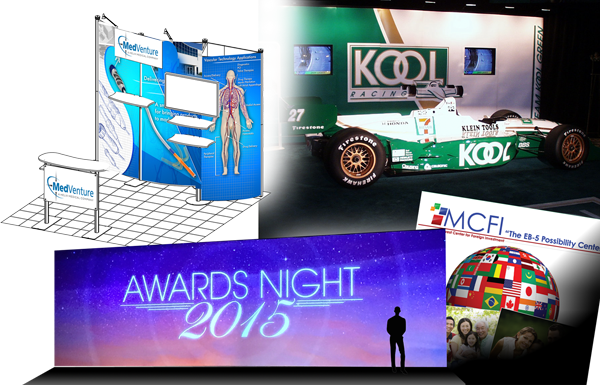 Trade Shows — Small to Large… Anywhere. Design, development and implementation of creative backdrop, integration of technology, logistical planning and onsite support. Conventions — Bigger than your trade show… we can be there too. Developed creative and technology solutions implementation for your Convention space, including logistical planning, production and onsite support. Company Facilities — Your trade show or convention can happen at your company’s campus. Any design and production that would hit the road can happen “at home” too. Exhibits — Similar to a trade show, more of a stand-alone presence such as kiosks, museum/lobby/visitor center installations. Complete with Audio and Video, Interactive technology integration. Banners & Signage — Any size, indoor or out! For your stage, hallway, lobby, wall, entrance or billboard.